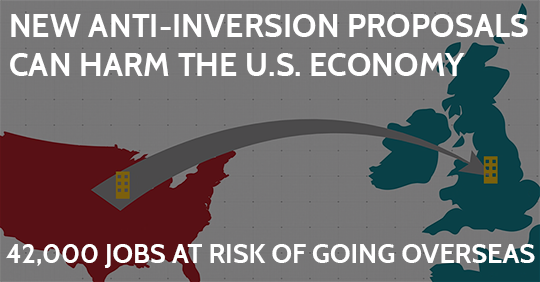 Proposals that fail to address the underlying incentives driving inversions put 42,000 U.S. jobs at risk of going overseas, according to new research from the American Action Forum (@AAF). The AAF research also found that the outdated U.S. tax code risks sending $988 billion in U.S.-based capital overseas. “As long as foreign markets continue to grow, and the U.S. maintains a comparatively uncompetitive code, the incentive to relocate headquarters abroad will remain. Worse, recent policy proposals that ignore this reality will further harm U.S. competiveness and jobs,” said Gordon Gray, AAF’s Director of Fiscal Policy.